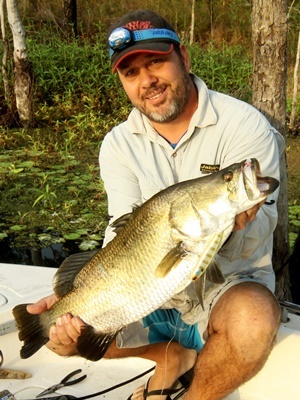 This 60cm barra was the author’s first impoundment barra and was caught on a suspending Zerek Tango Shad. It was definitely Ash’s weekend, catching some quality Awoonga barra. He put in the effort and reaped the rewards. Ash with a nice barra pulled out of the lily pads. Take plenty of gear because you will be rerigging a fair bit while casting in the trees. Joe on his thousandth cast… persistence is key. After all the hard work, Joe was rewarded with a lovely Awoonga barra. Fishing right up in the sticks paid off for the author and crew. When you’ve got views like this, the old saying “catching fish is a bonus” comes to mind. If you go there, enjoy the place and scenery because it’s just part of fishing with your mates. 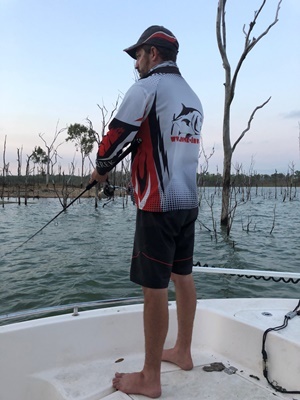 NOW Wazza is doing a lot more of the Moreton Bay Charters work, I have a bit more free time, so I decided to sneak up to Lake Awoonga and try my hand at barra fishing. 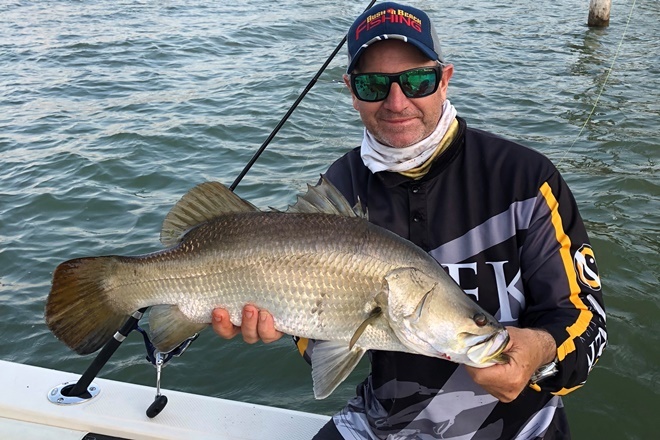 It was something of a last-minute trip because we were planning on heading up the inside of Fraser Island to do a bit of fishing but the weather wasn’t playing the game, so Awoonga was the second choice. 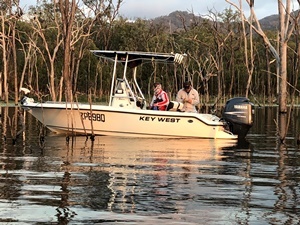 I was intending on taking somebody with me but at the end of the day had no takers and went up as Neville no mates in my boat, while fellow BNB scribe Joe Cormack and his brother Ash went up on their boat. This was a pretty spur of the moment thing, and I’d never been there and didn’t even know what the place looked like. 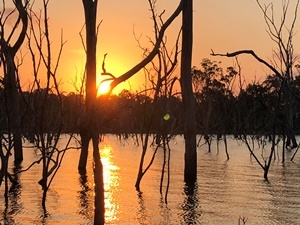 Joe had been to Awoonga once many years ago and Ash fished there at least 12 years ago and had a little knowledge of the area. I really went there with no expectations as I’d never caught an impoundment barra but I thought it would be great if I could snag one. We had heard that the week prior the fishing had been pretty good, so were in with a chance. On the first day we woke up to a rather stiff southeasterly breeze blowing 20 knots-plus at 4.30am. We put the boat in the water and Ash pointed to an area in the distance where he reckoned he did OK several years ago. Not knowing the place, I followed the boys to the other side. I soon found out me and my little 4.3m boat were not going to keep up with Joe’s 6m rig. It gets a bit lumpy out there and you need to keep an eye on the wind. We got to the other side relatively quickly and were greeted with a good half a metre of white-capping chop. We tucked into a few points but I found it quite difficult on my own with the breeze and no spot-locking electric, so after about an hour I decided I needed to head to the other side of the dam to get out of the breeze. Joe and Ash persisted on the points they wanted to fish while I took off. It was rather lumpy but within about 15 minutes I’d made my way to the other side of the dam where it was beautiful and calm. I started working a point with not a lot of success, so moved over to an area with a lot of standing timber, and lo and behold with a bit of luck more than good management, I found the local guide fishing there, which usually means a few fish should be around the area. I stayed well away from the guide as I didn’t want to annoy him. It was a rather large bay, so I had plenty of other standing timber to work. I persisted in there all morning, and after the wind dropped out it was absolutely glorious. Though I got a few catfish, I found no barra. About 10am I headed back to camp for a feed and a bit of a snooze to get ready for the afternoon session. The boys had success on the other side, with Ash landing one barra and dropping a couple. We headed out around 3pm for the afternoon session and the boys headed back over to the points while I went back into the trees. Joe and Ash didn’t have much success on the points, so they came over into the tree area where I was fishing. I continued catching catfish while Ash caught another barra and dropped three more in the sticks. It’s not easy fishing. In the woody tree areas you lose a bit of gear and a few fish. As darkness set in we flicked the navigation lights on and headed back to camp for a feed. The crazy obsessed fishers we are, as the moon came up around 9pm we decided why not head back out for another session, so we all jumped into Joe’s boat and headed back out to the points for a night fish. Now remembering that Ash had a couple of fish at this stage and Joe and I were fishless other than for catfish, we fished pretty hard. Despite our efforts, Ash hooked another fish but it shook the lure out of its mouth right beside the boat. At about 1am we were thinking we should probably head home because we were going to go back out at 4.30am, so a little sleep would be good. We got back up at 4am, headed out at 4.30am and were straight back to the sticks where we caught fish the day before, but this time we pushed right up into the bay. Joe pushed further up than me and soon the boys were yelling for me to come and join them. They were right up in the lily pads and the sticks and Ash landed two more barra and dropped a few more in the process. It’s very tricky fishing but the rewards of pushing the vessel so far up into the trees were definitely worth the effort. By this stage the sun was quite high in the sky and the fishing shut down, so we headed back to camp for some well-deserved sleep and another feed. 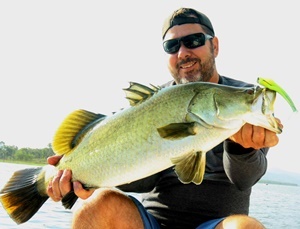 We headed back out in the afternoon and this was my last chance to catch a barra. The boys had an extra day to find fish but this was it for me. We all jumped into Joe’s boat and headed back over to an area where the breeze was coming into a bank holding a reasonable amount of wood. We deployed the electric and started casting. At this stage I realised a crucial point of difference between our setups. Joe and I had been using 50lb fluorocarbon leader while Ash was using 40lb mono, so I decided to change to 40lb mono. I tied on the Zerek Tango Shad I had been working through the trees for the past day and a half and proceeded to cast in towards the bank and tree line while Joe stuck with the 50lb leader. We were casting in that spot for about an hour, waiting for the sun to get down to the tree line and as soon as it did I got absolutely smashed right behind the boat. I got a couple of winds on the fish, it pulled a heap of drag and then popped the hooks. It was definitely a barra and I wasn’t disappointed as at least I hooked one. 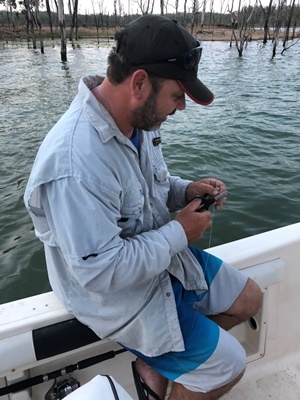 I checked my hooks and leader and proceed to keep casting in the same spot, just twitching that little suspending Tango Shad hard-body with long pauses. After about 20 minutes, whack, I was hooked up again, right behind the boat. 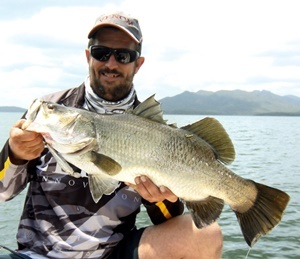 Some drag pulling and a few jumps later, a spritely 60cm Awoonga barra was in the net and all the effort had paid off. To say I was slightly happy is an understatement. I gave the fish a good look over, took a few quick pics and released it to fight another day. Ash hooked up on another couple of fish that afternoon but unfortunately lost them on snags. Poor Joe had put in a superhuman effort with at least 1000 casts and was still fishless. We headed back to camp for another snooze and a feed and I packed my gear because I was leaving early the next morning. As I headed home, the boys got on the water on the back of a storm. I know Joe tied on the 40lb leader and the boys had a great morning in the sticks, catching several barra and losing a few. For the three days of fishing we landed eight barra between us, with Ash definitely catching the most, which I put down to the 40lb leader. Not a lot of fish were caught while we were there, so remember, a week in fishing is a long time. I feel that despite us going up there with not a lot of knowledge, we still came away with a successful trip. I’ll definitely be back. For anyone planning a trip, try to gather as much knowledge as possible before you go, as it is a rather large place. I went up as a spur of the moment thing and really didn’t put a lot of planning in, but before I go again I’ll do a lot more preparation. Hopefully I’ll snag a mate to come with me, but then again it wasn’t too bad fishing by myself. Until next month, stay safe on the water.